Still checking up. Looks good. Thanks! We will get there. 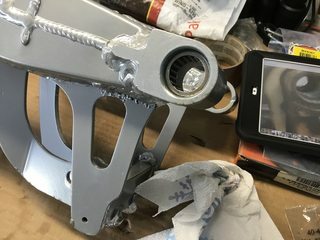 Made some more progress yesterday. 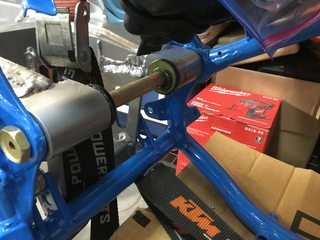 Bearings installed into the swingarm using a motion pro 20mm bearing driver. 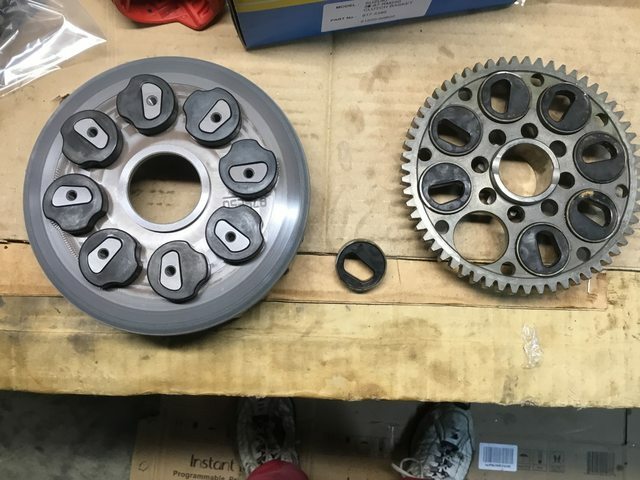 Suzuki manual called for bearing numbers to be facing outward and each bearing to be driven 7mm into the swingarm. 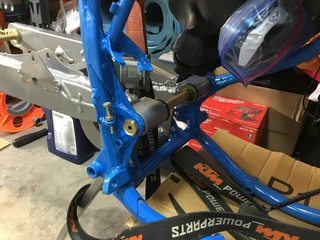 Very easy install, just make sure that your inner swingarm and bearing are clean and lightly greased. 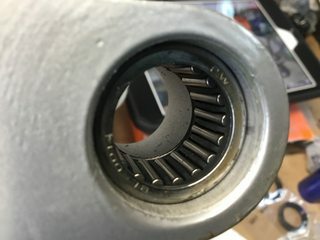 My garage was so darn cold that I didn't need to put the bearings is a freezer. 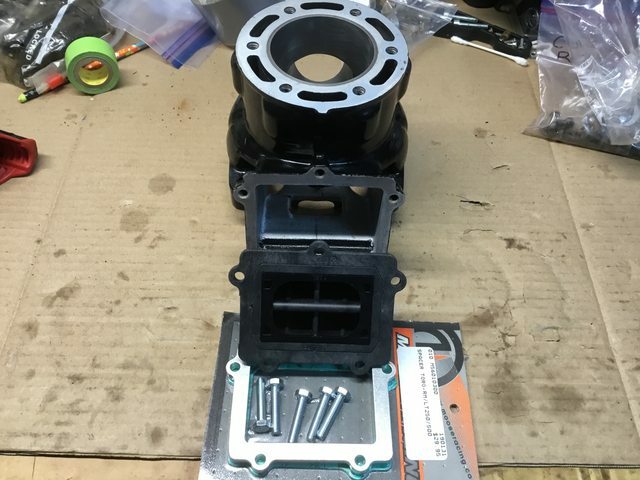 I packed a heavy amount of BelRay salt water proof grease into the bearings then the seals, then the outer spacer before I installed the bushings, then the inner spacer. Location: English but now based in South of France. 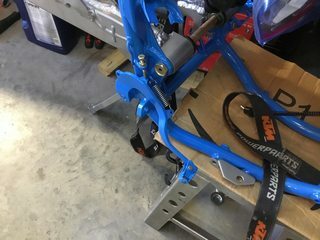 One more picture of the installed swingarm. 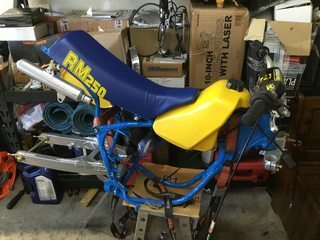 This is where we are so far on this build. 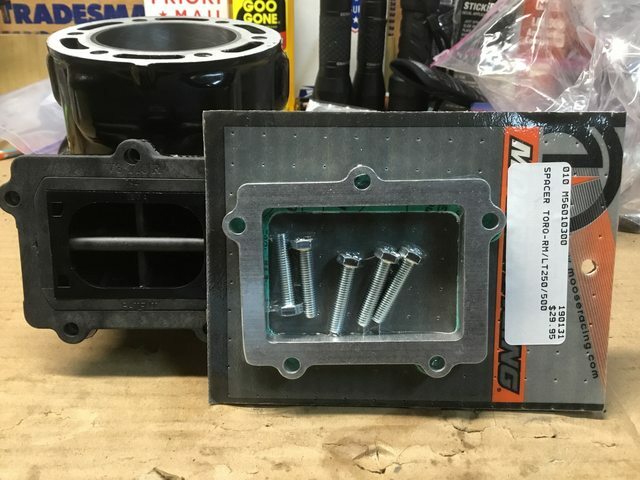 The four suspension rod linkage bearings should be here today. 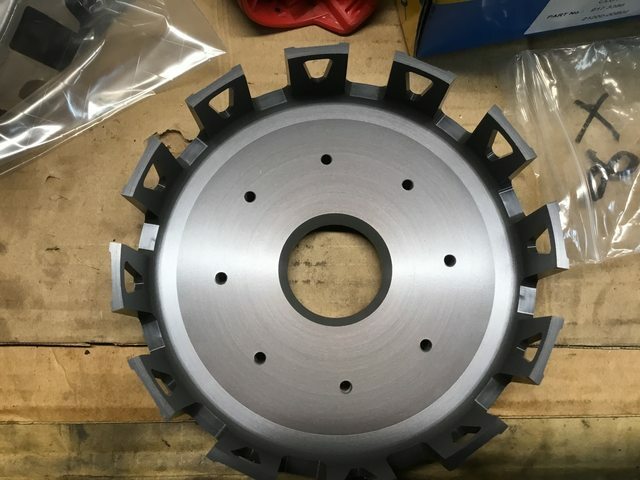 I just ordered a set of Goldentyres, a GT216AA 80/100-21 "Razor Blade" for the front and a GT523X "Gummy" for the rear. 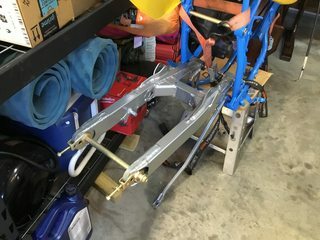 A lot of new parts are rolling into the garage. 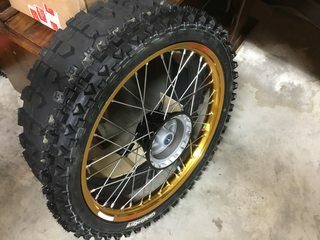 Goldentyre 216 Razor front tire with tubliss mounted on the new excel rim with Buchanan spokes. This was very easy to install.To the left is the unmounted rear Goldentyre Gummy GT523X, looks very wide doesn't it? 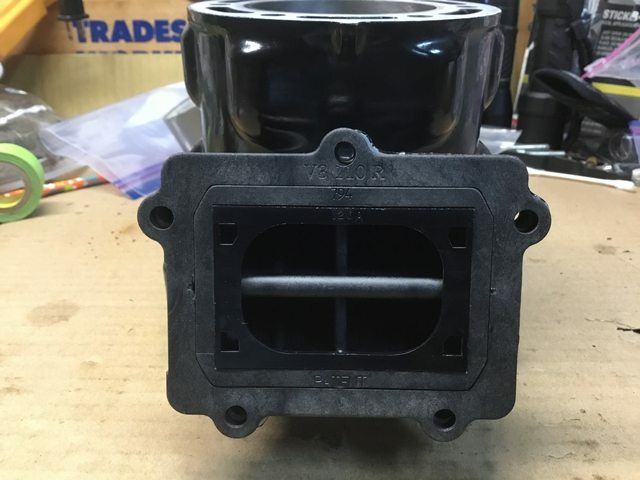 This is the rear gummy mounted up with the tubliss. 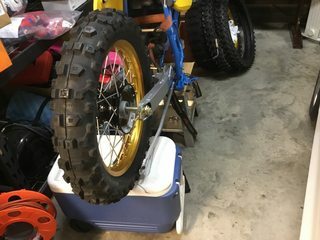 This tire took a little more time to mount but it wasn't bad.I used armour all to coat the tubliss components and soapy water to seal the system. 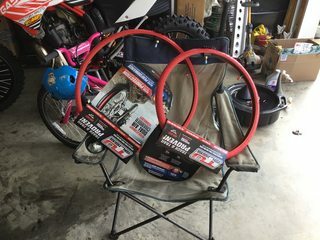 i bought two of these rear GT523x gummys, the other one is going on the gasser. 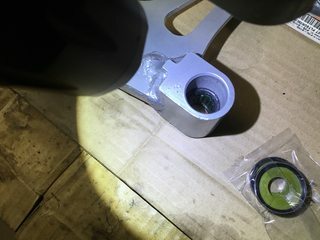 This is a VForce 3 Reed from a 1987 250/500 Quadracer, it is supposed to bolt straight into my RM cylinder. V3110-87. 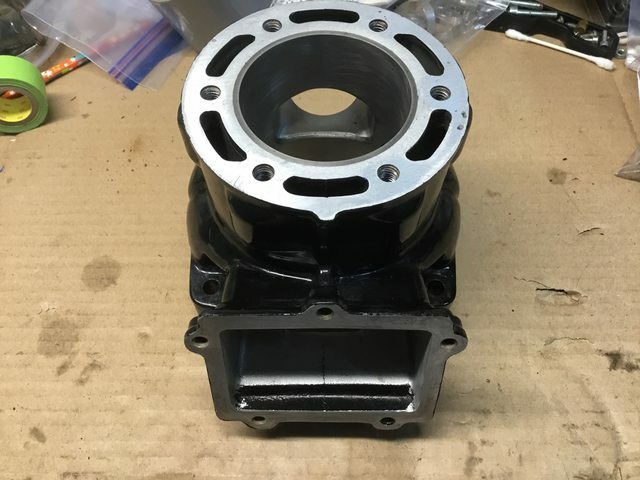 Also, this other part is a moose torque reed spacer. 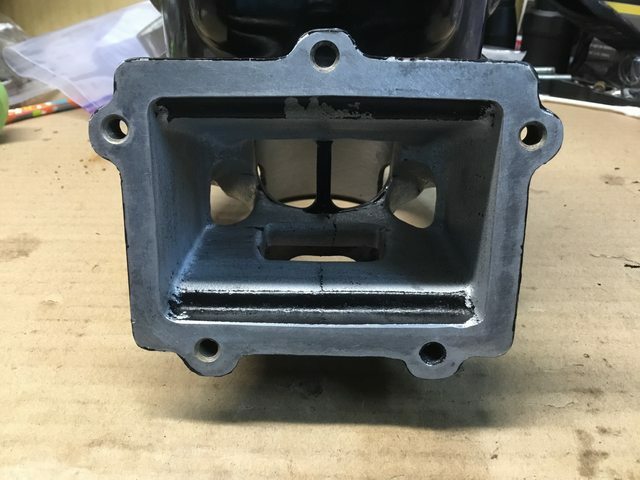 This should increase the bottom end and the cylinder has already been ported by Josh at ProCircuit and Josh milled the head to run on pump gas. Last edited by Moto7man; 02-08-2019 at 11:49 PM. 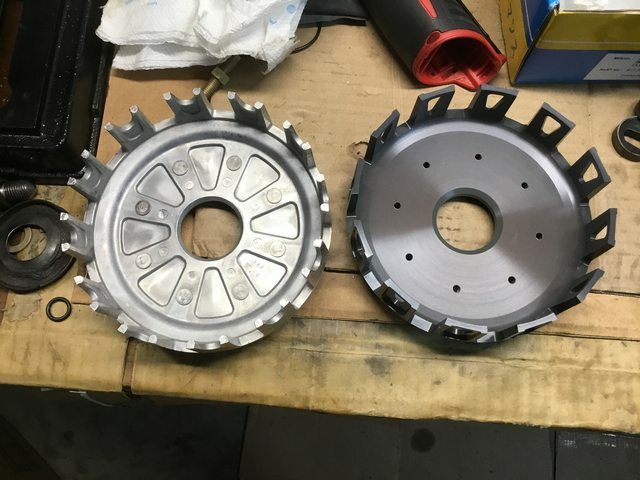 My stock Suzuki clutch basket is on the left and the Mitaka clutch basket is on the right. My stock basket was in very good shape but the stock basket cushions had play in them. The Mitaka basket is supposed to be stronger than stock. 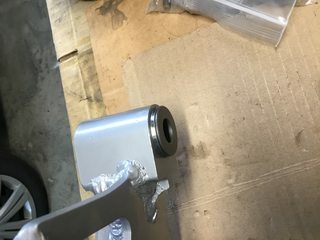 Disassembly of the stock basket was very simple, just use a drill bit to grind the head off the rivets holding the retaining plate, then pry the ring gear off with a screwdriver and push out the cushions by hand. The stock cushions have a metal ring around each cushion. The new cushions do not have the metal ring around the cushions. 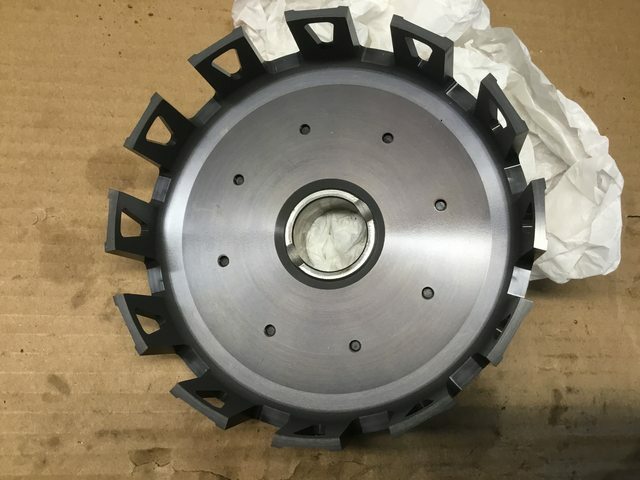 The new cushions fit very tightly on the ring gear. 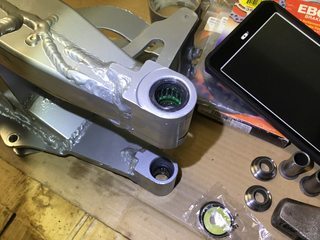 I applied a light amount of assembly lube on the cushions because that is what Rekluse reccomends per their clutch baskets, and the Mitaka instructions did not address this step. 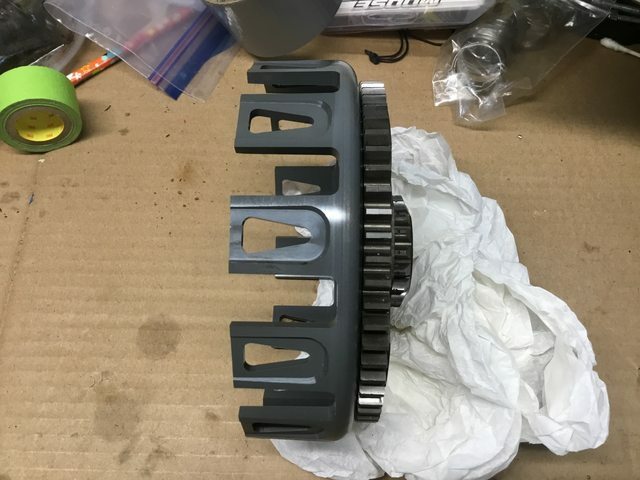 Then just press the ring gear onto the basket by hand making sure that everything is level and tight against the clutch basket. 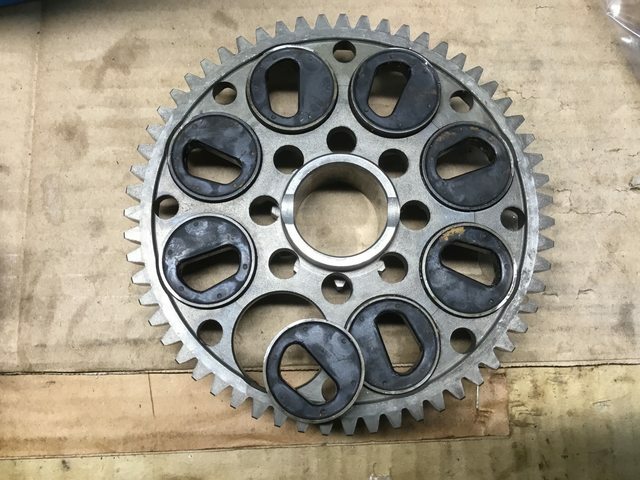 Unlike a CR 250, you do not need a press to remove and install the ring gear and you do not need to freeze or heat the ring gear for disassembly/assembly. 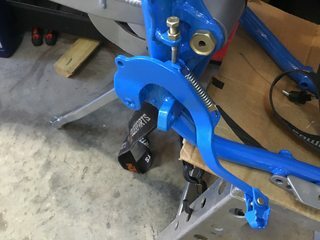 I tightened the supplied retaining plate bolts to 80 inch pounds which is about 6.6 foot pounds as required by the Mitaka instructions using blue loctite. 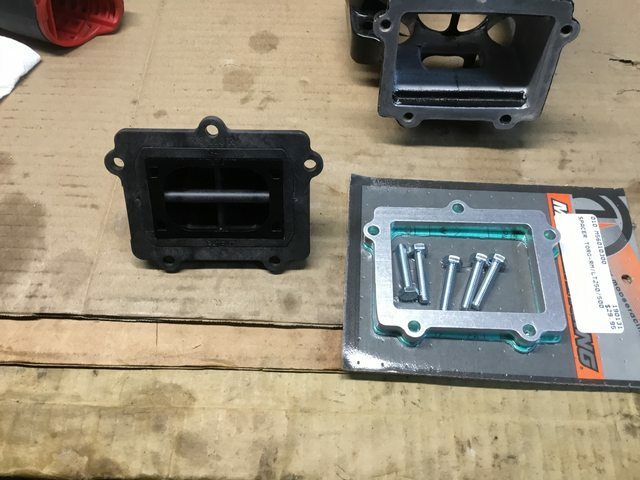 I would recommend being very careful on this step because it would be very easy to overtighten these bolts and break them. 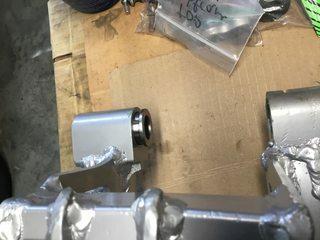 Rekluse recommends peening the retainer bolts but the Mitaka bolts do not pass completely through the basket so I could not peen them. 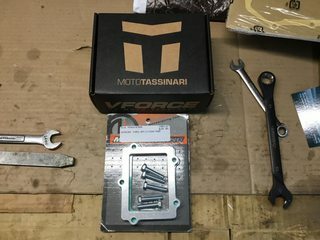 I just checked the fit of the VForce 3 reed with the ported cylinder and the Moose Torque Reed Spacer. Everything fits perfect. 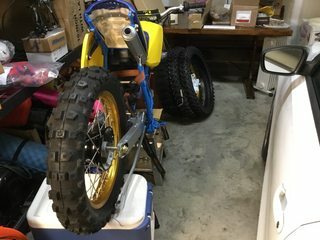 The guys at Works Enduro Rider just called me. 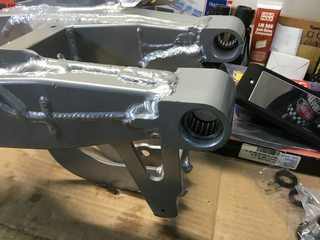 Bad news, they say my rear shock shaft chrome is hammered maybe the shock body too.Does anyone know what years of RMs 125/250/500 interchange with this model 1984 RM 250 E? 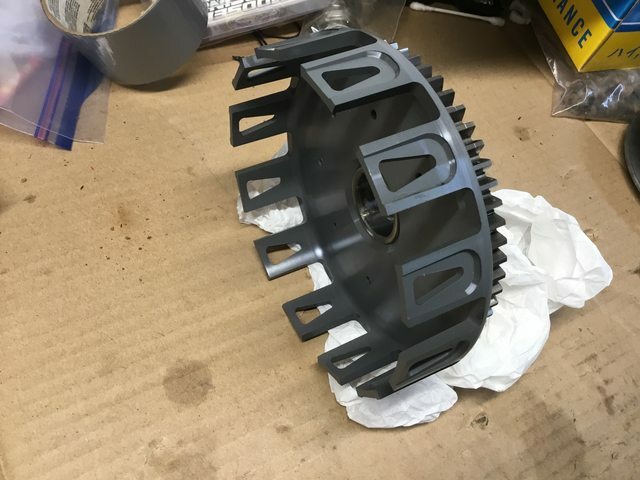 What about a brand new Ohlins like this? 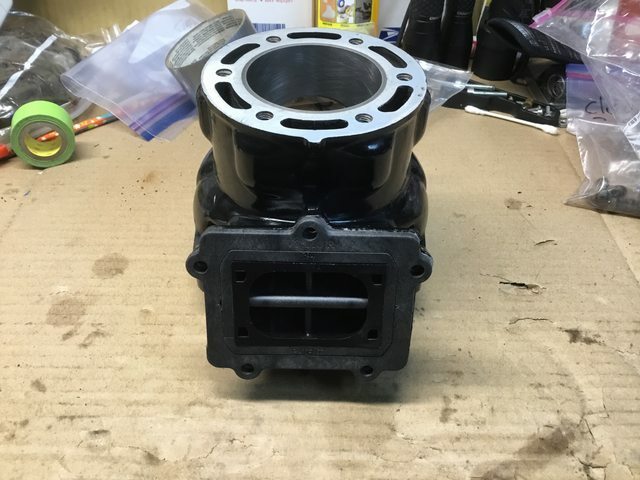 Does anyone know if this is a Fox Shock? This is the only thread that I could find on compatibility with other models.